Fishing is one of the oldest ways by which people have fed themselves and their families. Except for gathering shellfish by hand and spearing fish, primitive trapping is probably the oldest form of fishing. In early times, flowing water caused by tidal movement and changes in river and lake levels were probably used to trap fish behind rudimentary barriers, often made from sticks and stones. It is likely that early humans found that fish catches could be improved by driving fish into these barriers. They would have found that catches from these barriers decreased over time, as fish became accustomed to them, and would have had to move the traps to fresh areas where more fish could be caught. It would have been hard work to construct new traps, either by moving stones from the old trap or finding new ones. Primitive fishers probably tried making barriers from lighter, more readily available material such as tree branches, brush and vines This led to the fishers inventing lighter, movable traps made from brush and nets made from vines which they could carry with them when they moved to new areas. They may even have tried bigger, more complicated corral-type fish traps in lakes, rivers and coastal waters. These are shown in Figure 1. The “D” shape is preferable to the traditional rectangular fish trap in areas of stronger currents, as it offers less resistance to water flow and is less likely to roll. (Figures 1a and 1b), although other materials such as wood are occasionally used. The traps are usually covered with chicken wire, but welded mesh or prawn netting can also be used. The funnel tapers from 30 to 25 cm. It is made of similar material to the main trap and is fixed into the centre of one end (see Figures 1a and 1c). The internal funnel opening can be oval-shaped with the longest axis vertical. 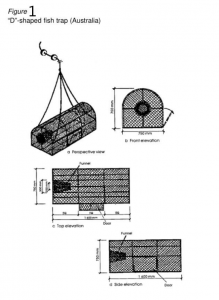 These traps are used in southern Australia to take leatherjackets (Monocanthidae) in deeper waters of the continental shelf and pink snappers (Pagridae) and other bottom-dwelling fish in shallower waters. In tropical Australia they are used to take fish such as jacks and trevallies.